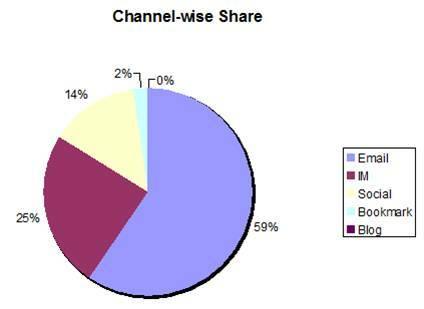 In spite of the rapid growth of social networks, email and instant messaging remain the most popular methods of sharing content online according to new research “Social Media Sharing Trends 2009 by Social Twist after analyzing information exchanges via its Tell-a-Friend content-sharing widget. The report details the current preferred methods of social sharing and points to the social media trends to follow in 2010. Today, email still rules content sharing garnering nearly 60% of communications, followed by IM at 25%, and social networks at 14%. 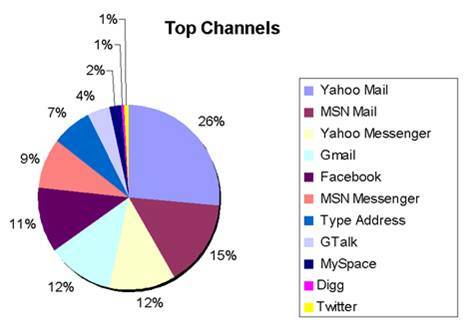 Most popular email services Yahoo Mail dominates with 44% of the market, followed by MSN/hotmail/windowslive mail at 25%. Gmail only has 19% of the market. Most popular IM services Yahoo Messenger enjoys 49% market share, with MSN Messenger taking 34%, GTalk ranks third with 15%, and AIM, the one-time market leader by AOL, only retains 2% of the share. One key finding from the study was that Google has failed to replicate the brand’s search engine success in it’s attempts to move into the ‘shared information’ arena with services like Google Bookmarking, Google Talk, Gmail, and Blogger. Most popular Social Networks for sharing should not come as a surprise; Facebook has trounced the scandal-plagued MySpace to lead with 79% vs. 15% of the market. The study’s research also found that users consider Twitter to be a news broadcast platform rather than a “sharing” platform. It enjoys only 5% of “shared information” traffic among popular social platforms – though it has risen 23x in the past year alone). Most popular Blog Channels WordPress leads with 45% of blog sharing (full disclosure, our ilookbothways.com blog is now hosted on WordPress), followed by Blogger at 42%, LiveJournal at 7%, Xanga at 6%. 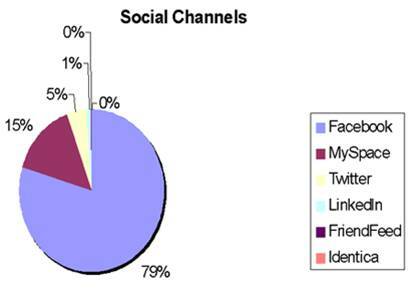 According to this research, the top 10 services represent 97% of the total personal content sharing. Unfortunately, the study did not include text messaging or photo sharing in their analysis, so we don’t see where these would fall in the mix, or which companies dominate these areas. The takeaway from this, and similar, research is clear – for most consumers, there are only a handful of companies used for online sharing of content. Focus attention on these few companies to insist they respect and protect consumer’s privacy, safety and security would mean that the vast majority of users would have considerably safer online experiences. Some companies on this list like Yahoo, and Microsoft, already do an outstanding job of respecting and protecting consumers. Others have poor-to-miserable track records, but you can change this by simply demanding improvements in the services – and letting the companies know that failure to improve will mean the loss of your business. Look past the red-herring objections that claim attempting to set standards on an industry where companies in any country can offer global services and make enforcement nearly impossible. How many foreign companies are on this list? ZERO. In spite of the specter of Hercules facing the multi-headed Hydra, all we really need to do is squarely target a handful of companies and ensure they protect consumer’s rights. This entry was posted on Wednesday, November 18th, 2009 at 5:46 pm and is filed under In The News. You can follow any responses to this entry through the RSS 2.0 feed. Both comments and pings are currently closed.